Item is a letter sent to an unidentified person (possibly Arthur Stanley MacKenzie) by James Baxter. The letter was written in Chatham on November 2, 1917 on letterhead from the Dominion of Canada Quarantine Station of the Public Health Branch of the Department of Agriculture. 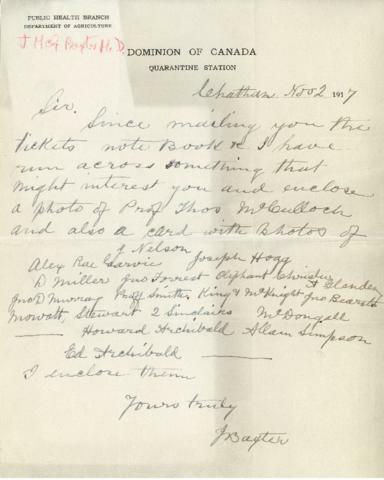 The letter refers to photographs of early Dalhousie professors and students sent along with the letter and names the people in the photographs. The photograph referred to in the letter is located in MS-2-7, SF Box 13, Folder 4, Item 1.